Marlene’s pairing of afternoon tea with her delectable cakes came to her one day as she was enjoying afternoon tea, perfectly content and lost in the moment. Following her passion for baking, Marlene has taken it to utmost level with Marlene’s Tea & Cakes, transforming her sweet creations into an art form. Her gorgeous designs offer a colorful palette that delights the senses and perfectly pleases the palate – any palate. Born in the Philippines, Marlene moved to San Diego when she was 4. She loved growing up in San Diego, earned a Computer Science degree at UC San Diego, and worked locally as a software engineer. After she got married, raised their son, and exhausted the corporate life, Marlene’s true passion for delicious became irresistible, and, thus, Marlene’s Tea & Cakes was born. 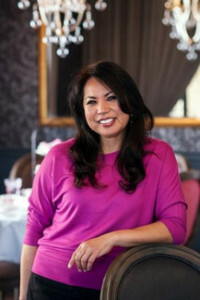 Marlene loves sharing her 5-star, savory creations with San Diego and warmly welcomes the community to afternoon tea. Because if there’s one thing to know about Marlene…it’s that she doesn’t like to drink alone. Food, especially baked goods; the comfort of sipping tea; relaxation; nurturing friendships; beautiful setting (flowers, pretty plates, etc); and the feeling of being pampered.